[CLOSED] WHAT’S THE UK’S FAVOURITE CUISINE? VOTE AND WIN A MEAL FOR TWO EVERY MONTH FOR A YEAR! Is there anything better than getting home to find your favourite meal on the table? Whether it’s a home cooked Sunday roast, a fish and chip treat on a Friday or a delivery from your local Chinese takeaway, a good meal might just improve the worst day or make the best day even better! At The Insurance Emporium, we love trying cuisines from all over the world but which is the best? To find out, we want you to tell us your favourite cuisine! What’s more, you could win a meal for two every month for a year*! This competition is now closed. Thank you very much for all your entries. You might have a soft-spot for sushi, be mad for Mexican or just love the taste of Thai food! 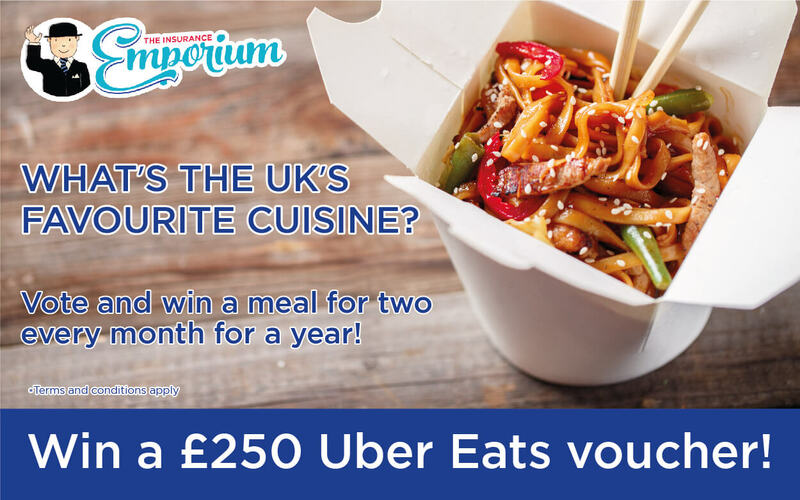 If you win our competition, you could be dining out for the next year using a £250 Uber Eats voucher! You might choose to spend it on a magical evening with your other half, a catch up with friends or even just a solo scoff on your favourite food! There are so many culinary options available to choose from! To enter, all you need to do is tell us your favourite cuisine! Just follow the link below, fill in your details and let us know what tickles your taste buds, then you could be in with a chance of winning a takeaway meal for two every month for a year*! It could be anything from French escargot to Italian pizza, we want to know what gets your stomach rumbling and your mouth drooling! The Insurance Emporium aim to help cover the things that you love most in life! Whether it’s fishing, horse riding or something else that you’re passionate about, we want to help you enjoy your adventures to their fullest! With everything from Pet Insurance to Wedding cover on offer, The Insurance Emporium could be the perfect fit for your needs! *A meal for two every month for a year is based on £10.40 a month per person to be spent on Uber Eats. This blog is in no way sponsored, endorsed or administered by, or associated with Uber Eats.